Photo Show Pro is a Slide Show allowing you to view pictures wrapped around geometric shapes that rotate and move various ways. Multiple pictures can be selected and multiple audio files play in the background. Objects can be resized and moved in the window. Movement speeds can be set, and time between picture displays. Window background color and lights on the photo can be changed. Rotational Effects and Transitional Effects can be set per Photo. Create and save many slide shows with easy access and maintainence. 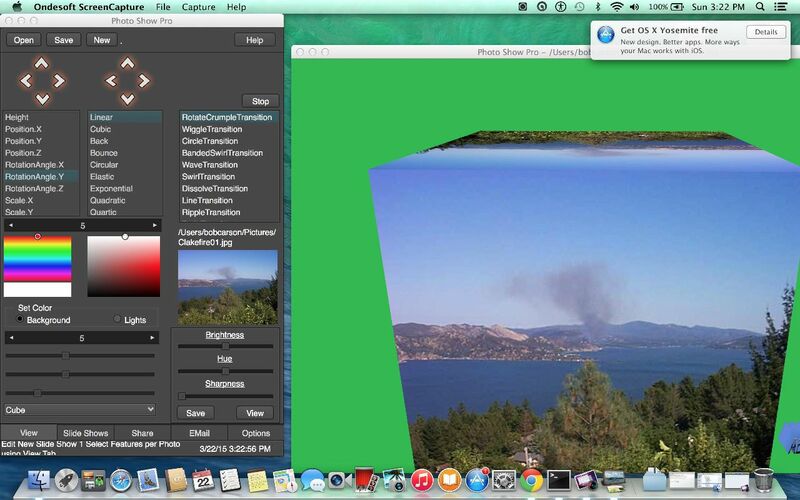 Photo Show Pro is an extension of Photo Show with many photo sharing capabilities. Photos can be sent and received between Desktop Computers and mobile devices (tablets and phones) running Photo Show Pro, Photo Show, Photo Snap, and File Viewer Express. Photos can also be uploaded and downloaded between major Social Networks and Photo Sharing Networks. Photo Albums are easily viewed on these websites and photos can be selected and added to your slide shows. An EMail module is also included that allows you to connect to your EMail accounts sending and receiving Photos available for slide shows. Options are available to set window style, effects, and email. Slide Shows can also be backed up and later restored. Share Slide Shows with Photo Snap and add Photo Snap Photo Albums to Photo Show Pro Slide Shows over LAN or WiFi. EMail Slide Shows and add received Slide Shows from Photo Show Pro to Photo Show Pro on other systems. This site does not contain serial number, crack, keygen Photo Show Pro Mac serial number : serial number is the simplest type of crack. A serial number(cdkey,product key,etc) is register the program as you may already know. a crack or keygen may contain harmful software. If you cannot find the exact version you want, just give it a try. for more information read .nfo/.txt/.diz file include in zipped file.